Some nights rock 'n' roll is mostly rebellion. Other nights it's chiefly aggression. With Tom Petty and the Heartbreakers Sunday at the Inglewood Forum, it was almost all celebration. From the enthusiasm in the arena, you'd have thought that the Rams had won the Super Bowl. Petty's a vital enough figure in rock to deserve the cheers wherever he plays, but the Forum show was special. Petty, who was born in Florida but who has lived here since the early '70s, is the most important rock attraction to emerge from Los Angeles in years. His new album has just passed the 1.2 million sales mark and he'll be on the cover of Rolling Stone next month. 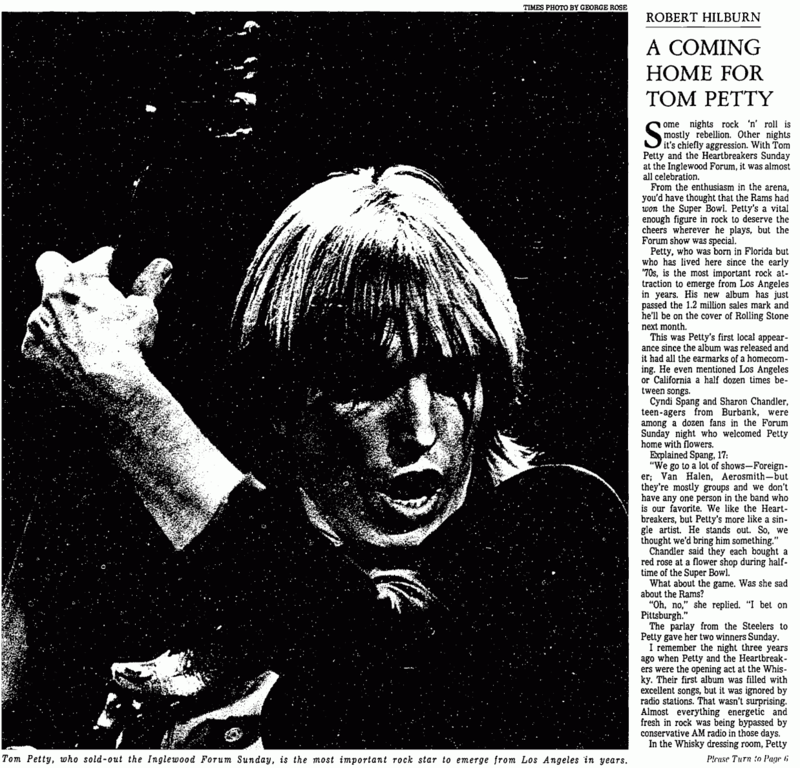 This was Petty's first local appearance since the album was released and it had all the earmarks of a homecoming. He even mentioned Los Angeles or California a half dozen times between songs. Cyndi Sprang and Sharon Chandler, teen-agers from Burbank, were among a dozen fans in the Forum Sunday night who welcomed Petty home with flowers. "We go to a lot of shows -- Foreigner; Van Halen, Aerosmith -- but they're mostly groups and we don't have any one person in the band who is our favorite. We like the Heartbreakers, but Petty's more like a single artist. He stands out. So, we thought we'd bring him something." Chandler said they each bought a red rose at a flower shop during half-time of the Super Bowl. What about the game. Was she sad about the Rams? "Oh, no," she replied. "I bet on Pittsburgh." The parlay from the Steelers to Petty gave her two winners Sunday. I remember the night three years ago when Petty and the Heartbreakers were the opening act at the Whisky. Their first album was filled with excellent songs, but it was ignored by radio stations. That wasn't surprising. Almost everything energetic and fresh in rock was being bypassed by conservative AM radio in those days. In the Whisky dressing room, Petty spoke about the decline of rock and how he'd like to restore real rock to the radio. The chances seemed so remote at the time that his remarks were almost naive. But Petty and the Heartbreakers are helping fulfill their pledge. Their driving "Don't Do Me Like That" single has been an AM hit for weeks and the new "Refugee" single could be their first break into the Top 10. The important thing isn't just that Petty has had a couple of hits. Dozens of artists have hits every month and then disappear. Petty is one of those rare figures who can inspire and shape. The tendency in rock in recent years has been to departmentalize. In the '50s, almost everyone who liked rock endorsed Elvis Presley and Little Richard. In the '60s, the rock audience united behind the Beatles and the Rolling Stones. Few rock artists, however, are now able to win the allegiance of more than a single area of fans. The new wave crowd may love the Clash, but care less about the more sedate Kansas. Followers of theatrical Kiss would probably rather watch TV than sit through an evening with the Grateful Dead. Because he touches on so many classic rock elements, Petty, like Bruce Springsteen, seems capable of forging a rock consensus. In fact, he may prove more successful at it then East Coast-based Springsteen. While Petty's music isn't as dramatically framed, it is more accessible. But Sunday's homecoming party almost had to be canceled. Petty, who played Friday night in San Diego, has been bothered by a bad throat and did have to postponed Saturday's Santa Barbara concert. Though his voice was pretty much depleted by the end of Sunday's show, he sang with almost torturous intensity for most of his nearly two hours on stage. When he held his guitar high above his head after the final number in the regular set, it was clearly a triumphant moment. I've seen Petty go since that opening Whisky show in 1977 to headlining at the Santa Monica Civic, Universal Amphitheater and now the Forum, and this was his most satisfying performance. One reason is the excellence of his new material. Another is his increased stage presence. Though his fondness for the exaggerated emotion of old-line R & B revues is wearisome in places, he projects the strong image that is essential to dynamic rock live. But Petty's band -- the Heartbreakers -- is also a much more confident unit. It was appropriate that the Forum marquee stated Tom Petty and the Heartbreakers rather than simply Tom Petty. Guitarist Mike Campbell, drummer Stan Lynch, bassist Ron Blair and keyboardist Benmont Tench aren't flashy, but they deliver a taut, flavorful sound that captures brilliantly the stark, yet evocative strains in Petty's songs. Part of Petty's strength is that his songs are simple, yet not one dimensional. He writes about the classic rock concerns, mostly girls -- but in a way that enables the specifics of the song to go far beyond romance to touch on the frustrations and joys of pursuing various desires. The opening four songs Sunday underscored the thematic variation in Petty's material. He moved from the witty anxiety of "Shadow of a Doubt (A Complex Kid)" to the teen bravado of "Anything That's Rock 'n' Roll" to the smoldering resentment of "Fooled Again (I Don't Like It)" to the unabashed optimism of "Here Comes My Girl." Petty returned for four encore numbers, but it was anticlimatic. His voice and emotion already had been spent. So had his best songs. The slender rocker should save one of his signature tunes for the encore rather than spend half his time on remakes like "I Fought the Law" and "Route 66." Still, the homecoming surely ws all that he and his audience had hoped it would be. The only thing that went wrong for teen-agers Cyndi Stang and Sharon Chandler was that when Petty reached down at the end of the show to pick up flowers, he didn't come up with their roses. He walked off stage with a larger bouquet that someone else had thrown. The Fabulous Poodles, a four-piece British band that opened the show, realizes the value of fun in rock. The group's logo is a pair of huge pink glasses and lead singer Tony de Meur wears clothes that seem ideal for a '50's revival group like Sha Na Na: blue jacket with red collar, black shirt and pink pants. The Poodles also have violinist who looks like Clark Gable. A special feature of Sunday's set occurred when the band, as a self-described "human jukebox," supposedly played whatever oldies the audience yelled out. The problem with the band is that it seemed to lean on familiar images and strains even when playing its own songs. The bluesy, sing-along "Work Shy" is straight from the Kinks' "Muswell Hillbillies," while "Bike Blood" is actually close to Chuck Berry's "Promised Land." Despite its attempted wryness, the Poodles' efforts don't seem fresh or inspired. The lack of punch was underscored when Richie Robertson tried repeatedly during the Who's "My Generation" to smash his bass guitar (a la Pete Townshend) and it wouldn't break. Maybe he'll have better luck when the Poodles play the Whisky next Monday and Tuesday.